If you do not know the answer on this fundamental question then you should definitely read this little guide! To launch a kite might seem as the easiest thing in the world. Nevertheless, accident happens on the beach due to people that are launching their kite in incorrect and even suicidal ways. You that have taken a kitesurfing course have hopefully learned to launch a kite through all the conditions. But to take the step from launching a kite under observation of your instructor to launching a kite on your own is a different tune. The purpose with this guide is to teach you have to launch a kite in a correct and safe way as well as giving you an understanding for things that can go wrong. Start by only hooking the leash into the safety line. Grab the chicken loop with your hand, control bar fully sheeted out. Check from where the wind is coming and position yourself about 80-90 degrees towards the wind, right at the edge of the wind window. Back away from the kite so that the lines are slighty stretched. The kite will now flicker since it not yet catch any wind to talk about. Have you ever been sailing? If so then you have probably heard of the eye of the wind. 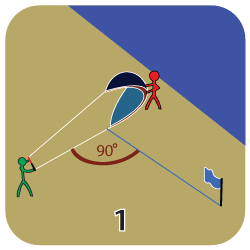 To position the kite in the edge of the wind window with the control bar fully sheeted out can be compared to position a sailing boat in the eye of the wind. Anyway, back to the kite. As the lines are stretched then take the opportunity for a last quick check of the lines to make sure that they aren’t twisted or stuck between a wingtip. Also check the bridles for any tangles. Now is the time to hook in the chickenloop. Hopefully, the person that is holding the kite for you knows what he is doing. Even though you have clearly instructed some random dude on the beach for help then never take for granted that he or she really will hold the kite until you give the thumbs up sign. It happens that people let go of the kite or just throw it up in the air before you’re in the right position. If you already have hooked in your chickenloop as this happens then you might get a nasty flight… Anyway, as the chickenloop is engaged, then sheet in the bar a bit and take some step upwind. The canopy will now start to stretch out as it gets caught by the wind. This is a sign that you’re positioned a bit upwind. 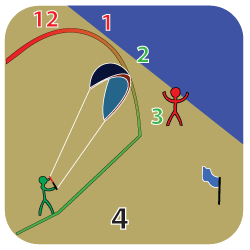 The further you go upwind, the more the kite will go into the powerzone while it also starts to push on your assistant. You will also see and feel that the kite is pulling quite a lot (depending on how strong the wind is). If your assistant let go of the kite in this position, then it will rush to the edge of the wind window with force with the potential risk that you’ll be yanked. So take a few steps back so that kite gets positioned in the neutral zone. Time for thumbs up! If you have positioned yourself perfectly, then the kite will hover in its position above the ground as your assistant let go of the kite. If the kite on the other hand falls backwards then you’re postioned too far downwind. 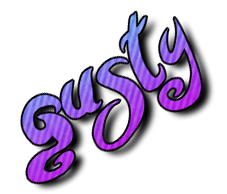 Hopefully your assistant will notice this and grab the kite again so that you can go further upwind and relaunch the kite. 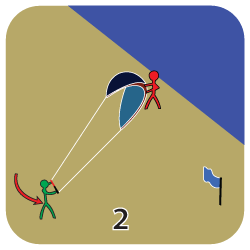 If your assistant doesn’t grab the kite then you can salvage the situation by moving yourself upwind to get power in the kite. Slowly steer, preferably with one hand only in the middle of the control bar, the kite up to it’s about 45 degrees above the ground. Then immediately head out in the water, there is no reason to linger on the beach? A common sight is however that people bring the kite all the way up to 12 and thereafter go out in the water. What’s wrong with positioning the kite at 12 o’clock? 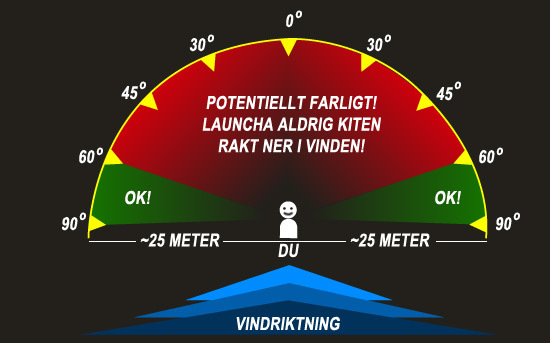 As the kite is positioned in 12 o’clock a.k.a zenith, then it’s in a neutral position, hence a position where the kite has a minimum of power. It might feel safe to keep the kite in this position, but you should be aware of the risks by keeping the kite in zenith. Two critical situations can occur. You’ll either encounter lofting or that there is a sudden wind drop. The risk to get lofted is highest when the wind is strong and gusty. Keep the kite at 12 o’clock when a strong gust hits the kite and you might get lofted and lose ground. You can imagine what will happen next… The opposite to a gust is that the wind suddenly drops, sometimes to a point where the wind gets so weak that the kite falls down from the sky. What will happen can you read about under “kitemares“. To launch a kite in a safe way is not difficult as long as you just do as the four images above are illustrating. It is however not irrelevant to also know what can happen if you or someone else is skimping with the launching, so let’s elucidate two, among beginners, common mistakes. If you do the mistake to not position yourself far enough upwind, then there is a risk for the kite to backstall, hence it fall backwards and down into the wind window. As this happens the kite often rolls over a turn or two and there is a potential risk for the kite to end up in the powerzone where it might catch the wind and gets launched with some serious power, resulting in you getting thrown away like a mitten. As you steer the kite up along the edge of the wind window then you don’t have to it overly slowly, but keep in mind that you’ll get more power in the kite if you steer it up more aggressively. Be extra cautious to steer up the kite too fast at strong wind or if you feel unsure wether the kite is too large for the current wind strength. The faster you steer the kite up the further down it will go into the powerzone increasing the risk for you being pulled up on land. The image to the left clarifies it. Tip! Launch the kite with one hand only on the control bar! A common sight at the beach is people who launch the kite with both hands on the control bar, something which comes with several disadvantages. 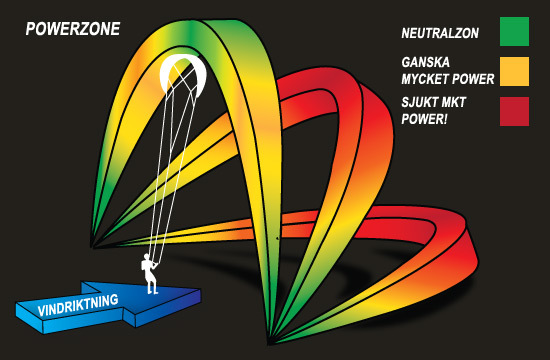 If you’re not equipped with gorilla arms then it’s basically impossibe to fully sheet the bar out and you will hence, depending on the length of your arms, get quite some power in the kite as you launch it while it also becomes more responsive due to the stretched lines. You will, to make matters even worse, due to this probably have a bent forward posture (to be able to reach out with your arms), that make you more likely to get yanked out of your grounded stance. In the event that you’re stumbling or slipping then it’s not unlikely that you’ll take one hand of the control bar to catch or fend off a fall. Then what do you think will happen if you only have one hand left at the end of one side of the bar… that’s right, you’ll happen to sheet in one of the bar ends and a nasty flight is a fact! So launch the kite with one hand only placed in the centre of the control bar (middle finger and forefinger on each side of the centre lines)! Launch the kite like this and you will not only have a much better ability to sheet the bar out, but it will also become harder to steer the kite up too fast). You will at the same time be able to put a lot more weight back and be able to withstand the power from the kite. Last but not least, you’ll get a free hand! What to do with a free hand? Well, you can for instance place the hand resting on the quick release so that you immediately can release it in case something goes wrong!